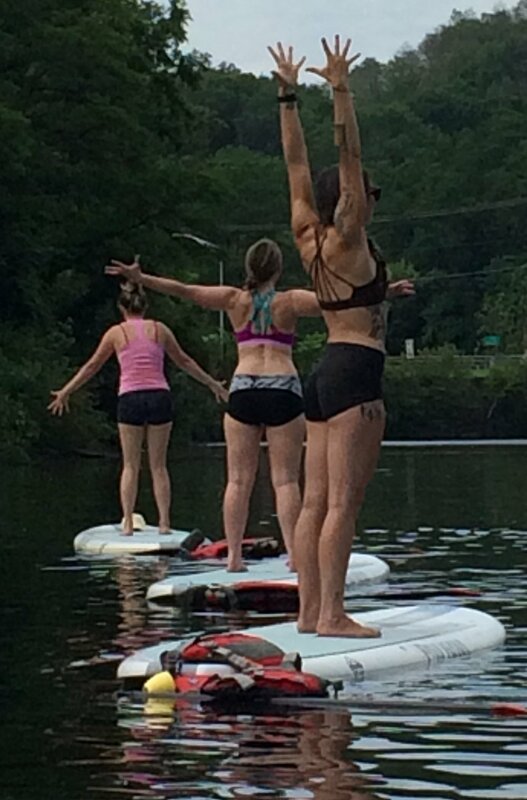 Summer Yoga with Nataly on the Farmington River! 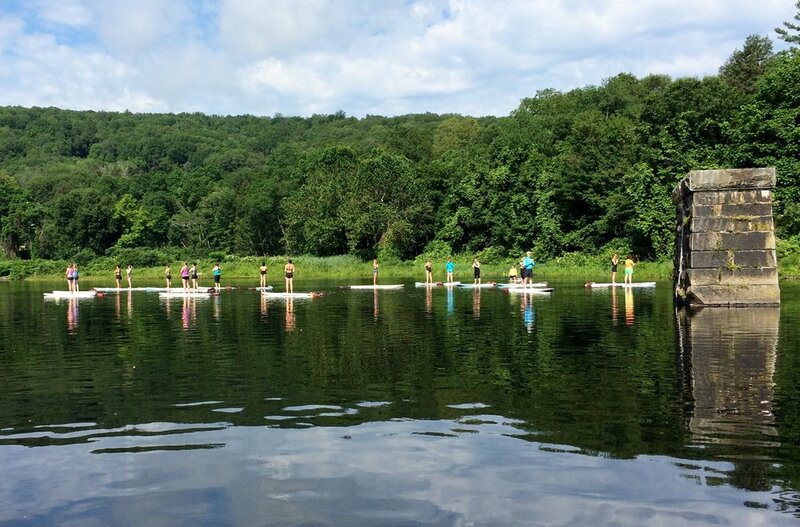 Launch onto the Farmington River with your SUP Squad for an action-packed 90-Minute Stand Up Paddle Board Yoga Class! Soak in the summer as you work at your own level and progress as you create balance on the board and within your mind & body. 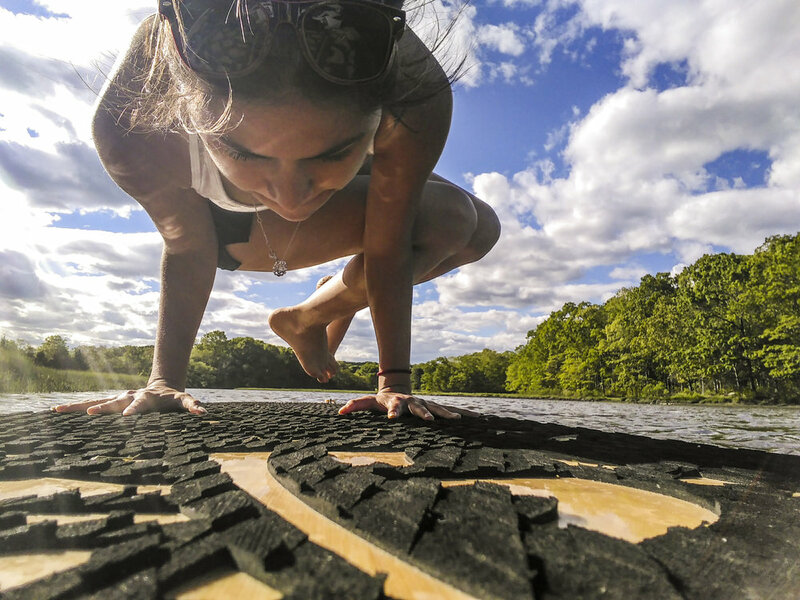 The yoga spot is located in a serene cove of the Farmington River backed by the beautiful backdrop of green trees and sky. On a still morning and evening, the water can look majestically smooth, and an experience to remember. SUP Yoga brings a little edge for excitement and a mental focus into your practice. With feedback from the board you will engage your core in a stronger way, be more in tune with your poses, and refine your practice quickly. You do not have to be an experienced yogi or paddleboarder as the boards are wide and stable; just bring your sense of adventure! Cost is $45, all equipment included / $40 for Hartford Sweat monthly and annual members. Wear water gear or swim suit. Hats & SPF are recommended. Please register through Hartford Sweat on-line, in-studio, or call 860-461-0910. As this out-door yoga is subject to weather, if Hartford Sweat or Collinsville Canoe determine that cancellation is required for rain, wind, or high water, you will have the option to receive a full refund. In the case of customer cancellation or absence, refunds will not be provided and the purchase will be applied as account credit for future use at Hartford Sweat. We recommend to arrive at the parking lot about 30 minutes before class start for time to park, get to the launch area where the paddle board will be ready for you and it takes 10-15 minutes to get out to the class site on the river. Hello! My name is Nataly and I was lucky to find yoga a few years ago when I was in search for relief for my chronic back pain. Little did I know that it would do so much more. Yoga has brought me calmness and inspired me to be a better person. I try to motivate my students the same way. My personal teaching style is very adaptive, upbeat, and therapeutic. My favorite part of teaching is finding ways to make my students' bodies feel better. Our daily lives of sitting and repetitive motion have adverse effects on our bodies and I firmly believe that yoga has the power to reverse these effects.